Front Runner has the perfect solution for any camp kitchen or in the home. Can be used where storage space is at a premium. 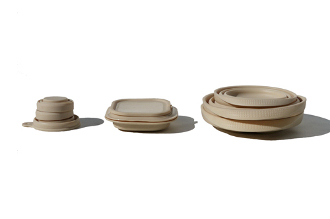 Food-grade flexible silicone folds into itself flat for compact packing. • The sides are flexible, so pouring liquids is easy. • Microwave, Oven, refrigerator, Freezer and Dishwasher safe! • Easy clean up using soap and water. • Comes stacked in a reusable netted drawstring storage bag. Perfect for letting the kitchenware dry while on the road. • The storage containers with lids can be used to store smaller amounts of food by only expanding the containers the amount needed. This is perfect for when fridge/cooler space is at a premium. • Unlike metal bowls and storage containers, the FlatPack Kitcheware Set is long lasting and corrosion resistant. • Collapsible for easy packing, yet made to retain their shape, these bowls are perfect for preparing and serving a gourmet meal anywhere. •Do not cut on these surfaces. Knives may damage product. •Clean with a cloth or sponge. Do not use a scouring pad.